Reminiscent of the poster that brought Margaret Thatcher to power? The poster was inspired, powerful and decisive: The treasurer of the Conservative Party considered it to have secured the landslide victory. If you come to one of our planning meetings, then you can pick up copies there – if you can’t come, please email BirminghamAgainstTheCuts@Gmail.com and we’ll look to arrange delivery to you via someone in your area who can collect from us. We’ve argued that austerity cannot solve our economic problems – and the GDP figures for the first quarter of 2012 confirmed that we are back in recession – a double-dip recession because we never grew back to where we were before 2008. 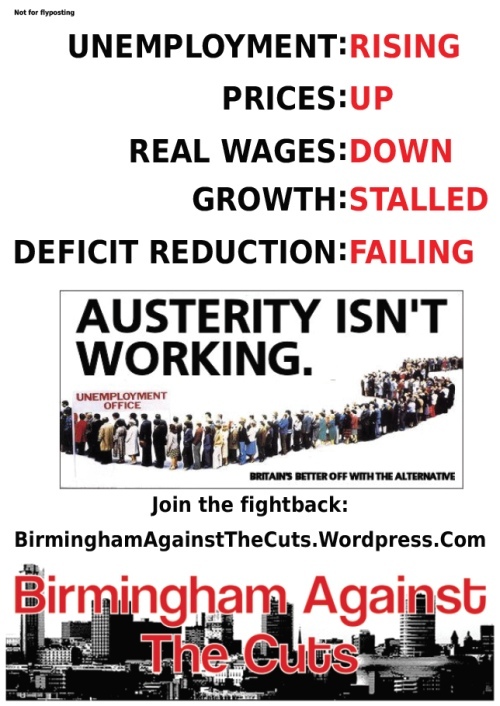 Put the poster up in your window or workplace and help spread the message – austerity isn’t working, Britain is better off with the alternatives.